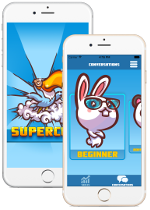 From the creators of SuperCoco—the opinionated Spanish conversation app. Rolling your R’s feels impossible—until you know how to do it. … And then it’s easy. When I was learning, most of what I found on the web was frustrating. A huge amount of “tips” and “tricks” that didn’t help and wasted my time. A way to break it down into simple steps that are readily learned. And that’s exactly what we give you in this guide: a series of simple steps—each one very easy—that gradually teach you this skill. It works because it’s based on the science of how the trilled R actually works. 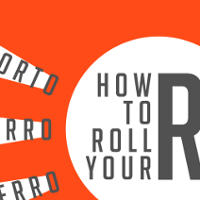 As a bonus, the awareness that you develop by learning to roll your R’s will help improve all aspects of your Spanish pronunciation. What is a rolled R? Tapping your tongue really-really-really fast! Instead, a trill is made by forcing air past your tongue in such a way that the tongue vibrates. That’s a really important concept. Even though your tongue is making a rat-a-tat sound, it’s barely working—it’s relaxed. Does that hammering sound come from your tongue hitting the roof of your mouth? Human languages have various types of trills. The rolled R is the most common trill—it’s the one used in Spanish, Italian, Russian, Arabic, and many other languages. Technically, it’s called an “apical-alveolar trill”—because all the action happens at the tip (“apex”) of the tongue as it approaches the “alveolar ridge” of your mouth. Can everyone roll their R’s? Yes, you can roll your R's! Assuming that your tongue is reasonably normal, you can learn to roll your R’s. But the reason people struggle with the trill is simply that it’s not obvious how to do it. Everything takes place out-of-sight, inside the mouth, where most of us have very little awareness of what our mouth parts are doing. Wondering how many years of practice it will take? You may have heard of people who tried for years and years before finally having their eureka moment. There's no reason it needs to take that long. With the proper guidance, no more than a week or two of daily practice is needed. Is it important to roll your R’s in Spanish? In a word: yes—although not as important as mastering the simple R tap. You can get away with using the simple Spanish R (instead of the trill) everywhere, because native Spanish speakers perceive the two sounds to be closely related. In fact, in rapid speech they will sometimes use a tap where a trill is expected.3 So, yes, you can get away with it. Since it’s really not that hard to learn, there’s no reason not to do it. We teach the rolled R in three lessons, with seven exercises. Most people won't be able to complete the whole sequence in one session. Expect to spend at least several days on lessons 1 and 2, before going on to lesson 3. As with any skill, consistent practice over days and weeks is the key to success. If you get stuck on a particular exercise, take a break. Come back to it the next day and you're likely to find that it's magically become easier—or at least you notice something new that you hadn't noticed the day before. That's how any meaningful skill is learned. Click here to download a PDF of our complete exercise series in a handy form for daily practice. Want to master the apico-alveolar trill? Get to know your tongue. Tongue—meet you; you—tongue. You may be tempted to skip these first exercises—but don't. All the difficulty of learning to trill comes down to not having the awareness of what's going on inside your mouth. Imagine you have a spoonful of peanut butter stuck to the roof of your mouth. With the tip of your tongue, reach far back into your mouth and scrape forward as if trying to remove the peanut butter. Move slowly and pay attention. Feel how your palate changes from soft (in back) to hard (in front). Feel your tongue pass over the ridge behind your teeth (that's your alveolar ridge!) and then onto the back of your upper teeth. Continue down the back of your bottom teeth and onto the floor of your mouth. Then reverse directions, letting the tip of your tongue inscribe a U-shape in your mouth. Do the same thing from side-to-side, with your tongue tip stroking the inside of your cheeks and lips. Go through the alphabet slowly, saying each letter out loud. For each letter, see if you can feel where your tongue is positioned or what it's path of motion is. If it touches another part of your mouth, where does it touch? If you're not sure, investigate by using a mirror (and possibly your fingers). Extra credit: Identify the six sounds in English where the tongue closely approaches the alveolar ridge. Answers are at the bottom of the page. But the point is not about the answers, the point is to develop your awareness. In the rolled R, the tip of your tongue vibrates against the alveolar ridge. But I recommend you start with an easier vibration—just to get used to how trills work. This first vibration doesn't involve the tongue at all. It's a lip vibration. This is the sound we use to express "Brrr—it's cold!" or that kids use when they want to make the sound of an engine. I like to start here because everything's visible—not hidden inside the mouth. But the mechanism is just the same. Do this exercise even if you can already make this sound, so that you understand the mechanism. For this trill, your lips are almost completely touching and you direct the air stream right between them. Your tongue is relaxed. Notice how, if you relax your lips completely, the air just flows out with a whooshing sound. Now, while breathing (and whooshing), gently activate your lips so that they come together, closing the small gap. If you close them hard and fast, you'll simply stop the air flow. But if you close them slowly and gently, in a relaxed manner, they will begin to vibrate! Do the lip trill both with and without vibrating your vocal cords (make a "mmmm" sound). Keep your lips tense and gradually make the gap smaller and smaller without completely stopping the air. What happens? I believe the closed tongue trill is the simplest, easiest tongue trill to learn. Get the hang of this trill, and the rolled R is just a small step away. 4.1 Start by saying "Shhhhhhhhh". Give a really good shush to that person in the library talking on their cell phone. 4.2 Now say it again, but this time cut the sound off in mid-stream just by using your tongue. Take a moment to find it for yourself. You cut off the air flow by pressing your tongue flat up against the roof of your mouth. 4.3 Experiment with using just your tongue to repeatedly open and close an air gap with the roof of your mouth. Try both "shhh" and "chhh" sounds, one may be easier for you. Get used to moving your tongue consciously towards and away from your palate. It's important that you don't move your jaw or lips when doing this exercise. Use only your tongue so that you develop conscious control. That's the key. 4.4 Now, say "shhh" using plenty of air, only this time start to close the gap but don't quite go all the way. Just as with the lip trill, you will find that at a certain point vibration begins. A relaxed tongue will vibrate sooner and with less effort than a tense tongue. How relaxed your tongue is. Bravo! Your tongue is vibrating! Although this sounds more like a muffled jackhammer than like speech, believe it or not, you're very close now to having a usable alveolar trill. We are finally ready to tackle the trill that makes the rolled R! It is produced exactly the same way as the closed trill, except your mouth will be more open and only the tip of your tongue will approach the roof of your mouth. 5.1 Start with the closed trill and let your mouth open—but don't let the front of your tongue release from it's position. Keep the trill going! The back of the tongue will naturally come down with your jaw, but the front should stay up. You are almost there! This is an open mouth trill, using the blade of your tongue. It should be just a small positional adjustment from the end of 5.1. Now activate the vibration as in 5.1. Now you are trilling with the tip of your tongue. If you can't find this trill, go back to 5.1, to remind yourself. Alternate between 5.1 and 5.2 until you can readily start from either position. 5.3 Experiment with the key ingredients: amount of air, width of gap, degree of relaxation—to develop your control over the trill. 5.4 Experiment with making the alveolar trill both with and without vibrating your vocal cords (make an "uhhhh" sound). 5.5 Bonus exercise: experiment with moving the point of contact to different places (behind the teeth, further back in the mouth, etc.). You are over the hard part! Even though your pure trill sounds more like kids playing cops and robbers, one more small step will bring your trill into the realm of language. Start with an open "ah" sound: Relax your mouth and throat and give a good long "Ahhhhhhh". Now try alternating "Ahhh" with the trill. Don't worry about connecting them yet, just say "Ahhh", make a trill, say "Ahhh", etc. Get used to snapping into the trill position (from Exercise 5) from your open vowel. If it's hard, you probably need to spend more time on Exercise 5, mastering the pure trill. Without stopping the vowel sound, simply close your mouth slightly and move your tongue into position. Use the air flow from the vowel to start the trill: "Ahhhhrrrrr". You may actually find this easier than pausing in-between, since the vowel gets your air stream started for you. For practice: Experiment using all five Spanish vowels: /a/ + trill, /e/ + trill, /i/ + trill, /o/ + trill, /u/ + trill. You'll find that some are quite a bit harder! That's normal and makes for great practice. The pronunciation trainer in the SuperCoco app lets you record yourself and instantly compare to a native speaker. Super helpful! Congratulations! You can roll your R's!!! Believe it or not, there's more. Click here to download a PDF with our complete exercise series, including advanced exercises to help you clear up common issues that make your trill sound non-native. A. The trill is obligatory whenever you see the double "rr". That occurs only in the middle of words such as perro and carro; the trill is essential so that the word is not confused with its tap counterpart (eg., pero, caro). C. The trill is obligatory when a single "r" follows "n", "l" or "s", as in alrededor or Enrique. D. The trill is optional at the ends of syllables and words (eg., puerta, mar). When you’re comfortable rolling your R’s, take it to the next level by practicing some Spanish tongue twisters. For maximum benefit, memorize and try to work up to high speed. (Easy) Rosa Rosales cortó una rosa. ¡Que roja la rosa de Rosa Rosales! (Hard) Rosa Rizo reza en ruso, en ruso reza Rosa Rizo. (Impossible) Borracho un ratón robó un ramo de rosas rojas; el rabo se le enredó y rodó de rosa en rosa. (Silly) El perro perra encontró pera, pero perro perra peras no come; en cambio perra perro peros no encontró para comerse la pera que perro perra dejó. Alveolar: This is the one you just learned. Across languages there is variation in the exact location, ranging from just behind the teeth to behind the alveolar ridge. Uvular: this one is further back in the throat, produced by narrowing the space between the back of the tongue and the uvula. It is found in many European languages (including French, German, Dutch, Portuguese), though typically it is only one of several interchangeable sounds. English speakers often make this by accident when trying for the alveolar trill. Bilabial: This is the lip trill that you learned, above. It is used in a number of lesser known languages around the world. Epiglottal (pharyngeal): This trill is further back even than the uvular trill. It is found in a number of languages, including Arabic and Hebrew. Probably because of the widespread myth—now debunked—that the ability to curl one's tongue is genetic. Vihman, M. N. (1996) Phonological Development, Cambridge, MA: Blackwell. Lewis, A. M. (2003) Coarticulatory Effects on Spanish Trill Production in Proceedings of the 2003 Texas Linguistics Society Conference, ed. Augustine Agwuele, Willis Warren, and Sang-Hoon Park, 116-127. Somerville, MA: Cascadilla Proceedings Project. Careful if you not a native English speaker—your /t/ may be placed elsewhere! Download the complete exercises, including advanced techniques to help you sound more like a native.